The most versatile attachment you will ever own. Pulverise and prepare seedbed, de-thatch or remove old lawns and weeds all with one tool. Cut drainage grades, skim passes for over-seeding or prepare and condition job sites for seeding. Remove rock and other debris by windrowing or make a pile for easy pick-up with your loaders bucket. Seedbed preparation, site clean up, rejuvenating old turf, reconditioning hard soil, trench restoration, leveling, windrowing debris, drying out muddy sites, site preparation and blending materials. 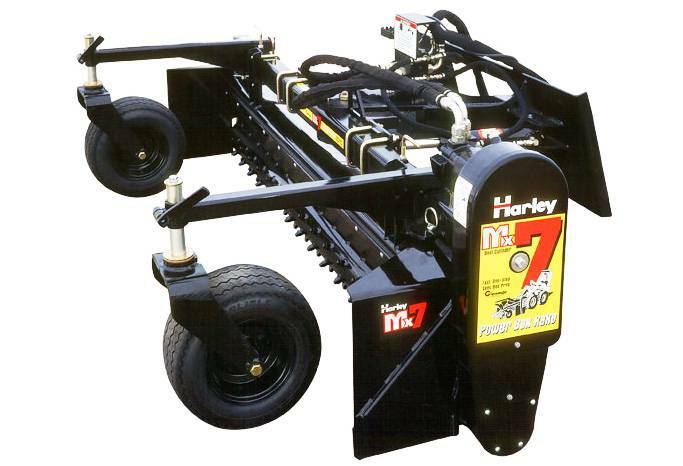 For pricing or more information about the Harley Rakes fill out the form and we&apos;ll be in touch soon. Alternatively call (08) 9457 1544.